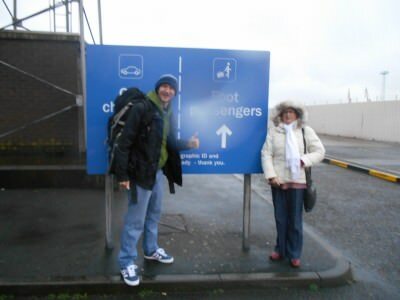 World Borders: Getting ready to board the Belfast to Birkenhead ferry and crossing from Northern Ireland into England. 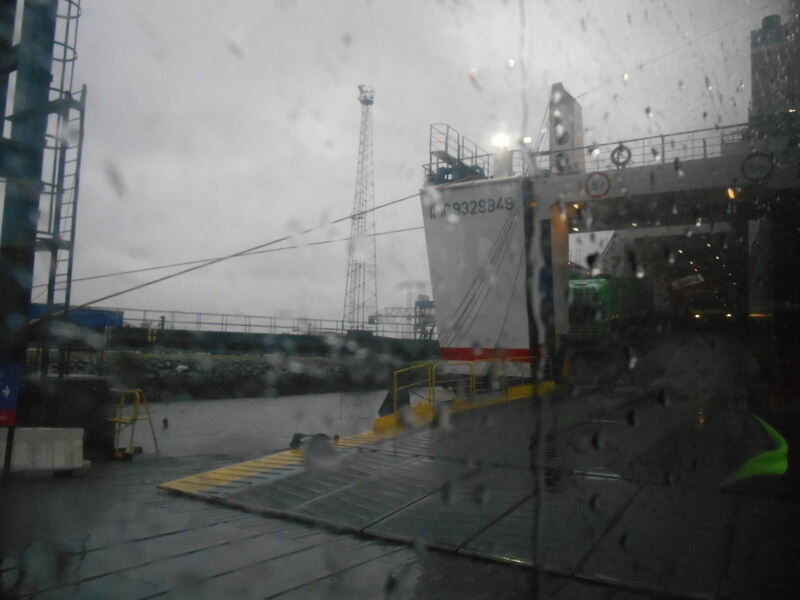 It was a return to the familiar border crossings for me earlier in the year as I got the ferry from Belfast to Birkenhead. It’s a great way to get from Northern Ireland to England, and also avoids the hassle of flying, allows you to drive there by car, bring as much as you want (no bans on deodorants/liquids etc.) 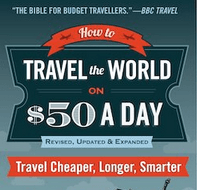 and is also much cheaper than going by plane anyway. I’d totally recommend it. OK there are a few ways to book your ticket, the easiest being online. 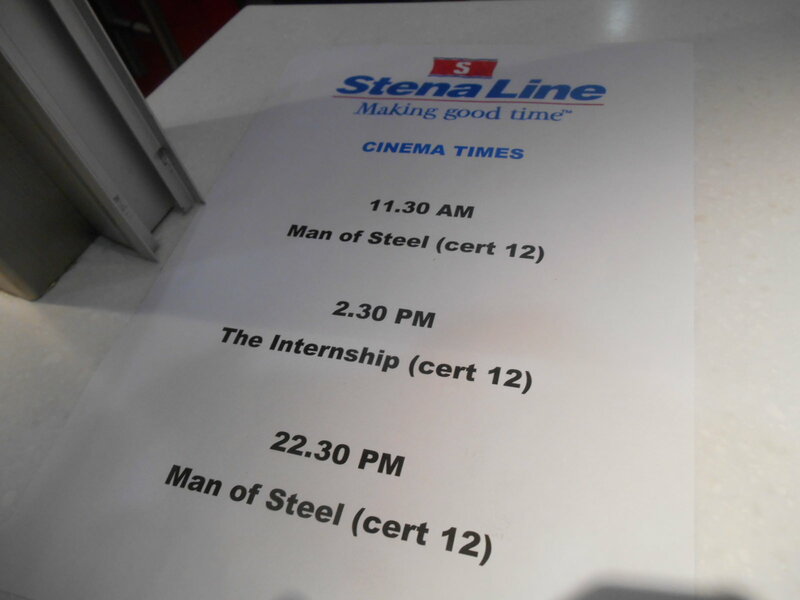 Just go to the Stena Line Website and pick your sailing and your day. 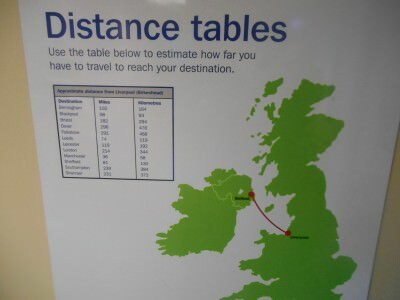 For the crossing I did and recommend you want Belfast to Liverpool. Basically Birkenhead is classed as Liverpool. 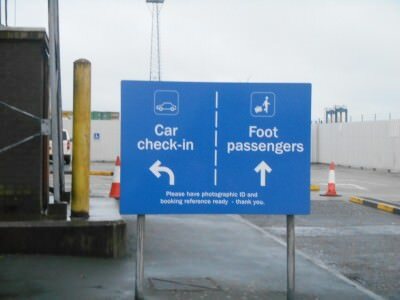 You can book with a vehicle or as a foot passenger. 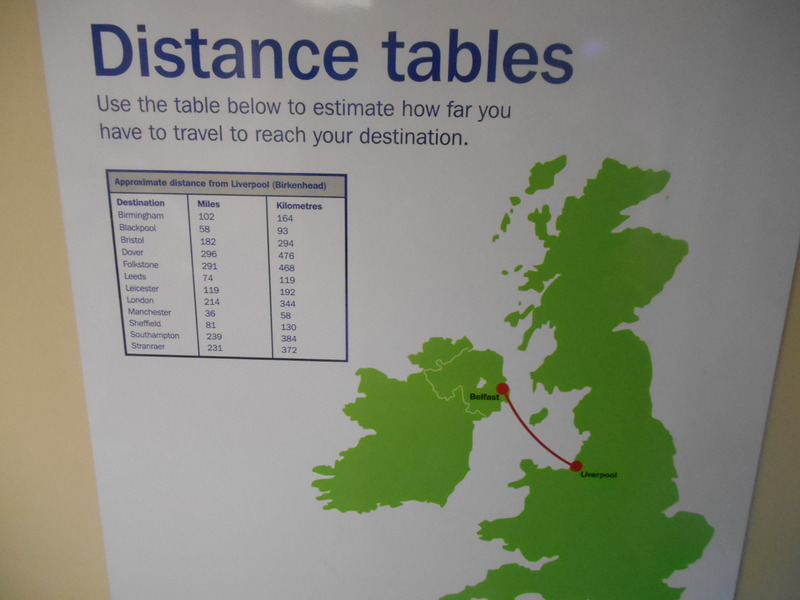 There are other routes out of Northern Ireland (Belfast and Larne) to England (Fleetwood) and Scotland (Larne, Cairnryan) but my favourite is the night crossing from Belfast to Birkenhead. Boarding Card for the Belfast to Birkenhead ferry crossing from Northern Ireland to England. I have been with a car in the past, however for this post I’ll concentrate on the backpacker style crossing – i.e. a foot passenger. 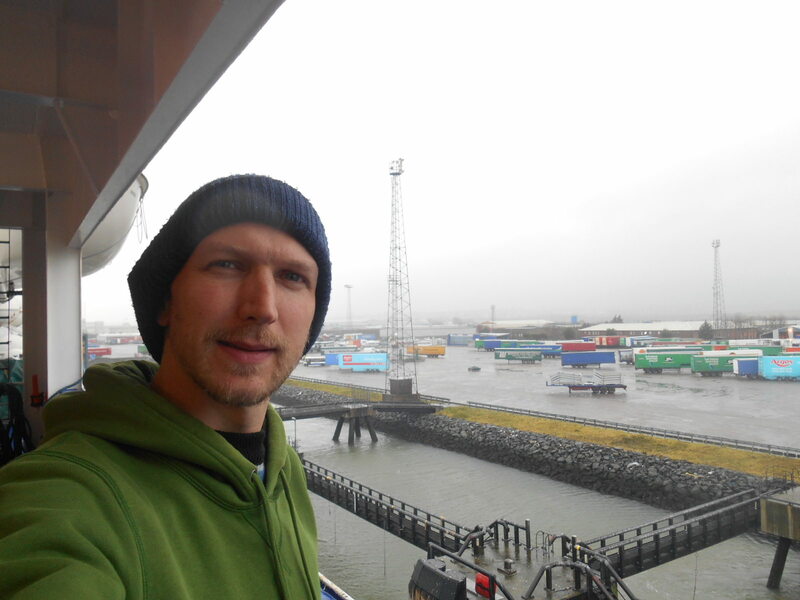 My most recent bit of travelling in the UK was done on buses and ferries. The entrance to the ferry terminal in Belfast – car check in and foot passenger check in. 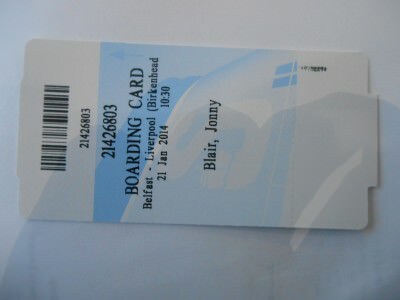 Currently the foot passenger ticket is a bargain price at £19. There are two sailings – a daytime sailing and a night time sailing. 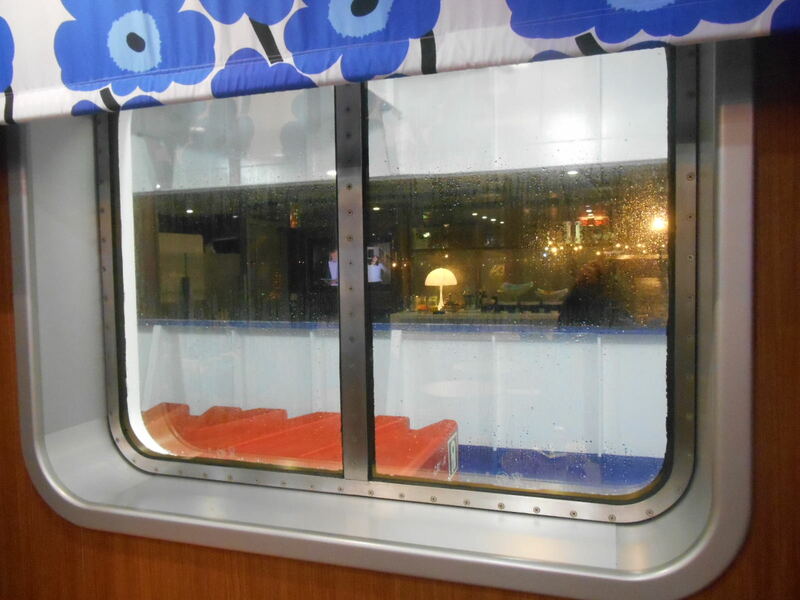 I chose daytime, though in honesty I normally prefer the night sailing – you do pay extra for a cabin though. 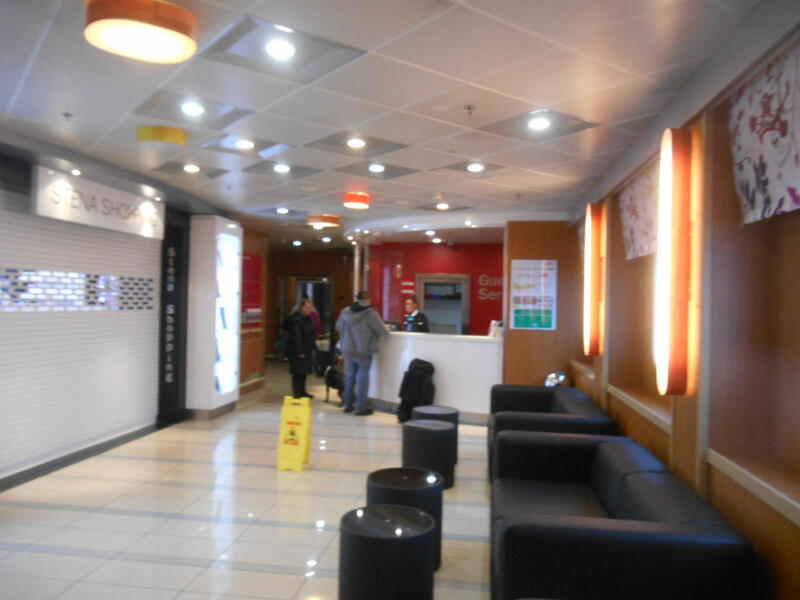 After checking in at the foot passenger desk, you’ll be given your boarding pass and if you have paid for a cabin or the lounge you will get a pass card for that. 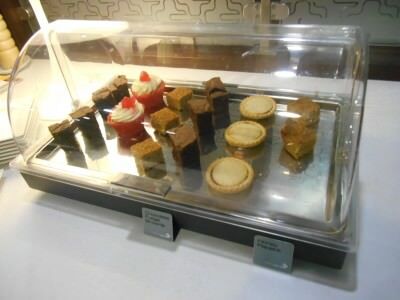 It costs an extra £20 for access to the lounge. 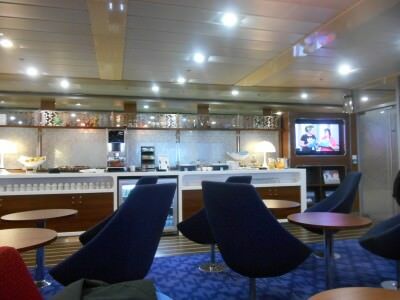 It’s a business lounge known as the Stena Plus Lounge. Saying goodbye to my parents in Belfast harbour, again. 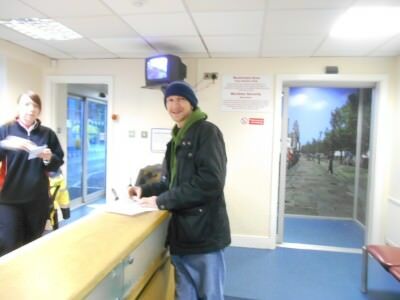 I had made a surprise visit back to my hometown of Bangor in January 2014 – first visit to Northern Ireland in 2 years but it went very quickly. 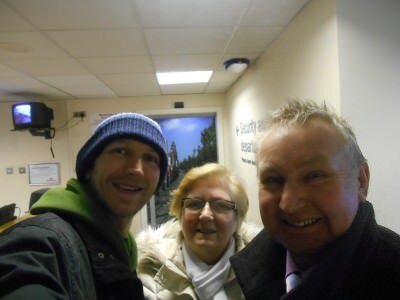 My Mum and Dad gave me a lift to Belfast ferry terminal and I was off on my adventures again. No matter how old or experienced we get in life, there is ALWAYS a hint of sadness on these moments. Leaving Northern Ireland each time still makes me cry. Saying bye to Mum in Belfast, Northern Ireland. 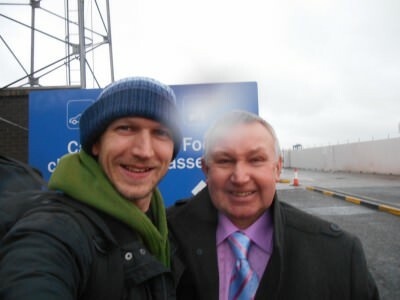 Saying bye to Dad in Belfast, Northern Ireland. I said my farewells to my parents and headed into the waiting room. The waiting room/boarding lounge in Belfast is actually pretty cool. 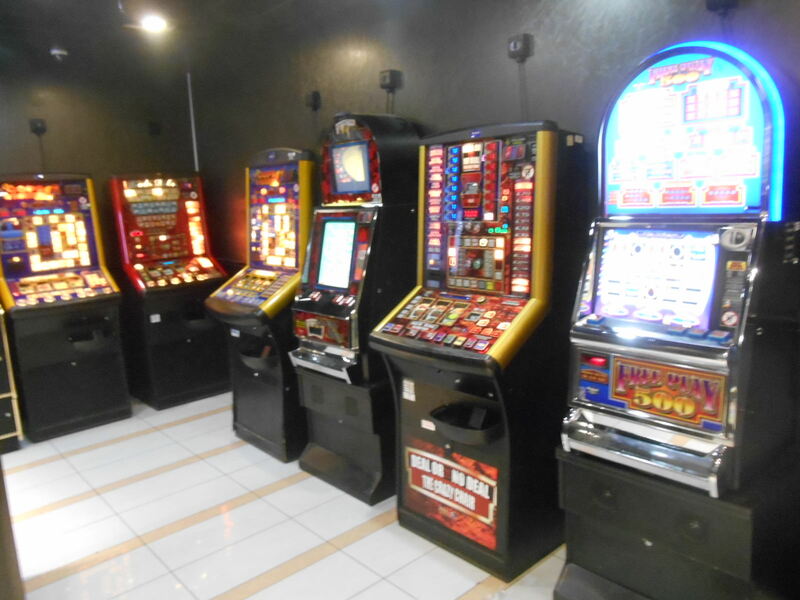 It has TVs on, newspapers and drink dispensers. 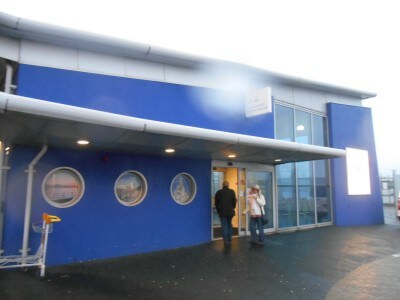 Getting my ticket and boarding for the ferry from Belfast to Birkenhead. After getting my boarding pass and waiting in the boarding lounge for 10 – 20 minutes we get a bus that takes us onto the ferry. The ferry was due to leave at 10.30 am. We boarded around 9.45 am. The boarding lounge/waiting room in Belfast harbour. 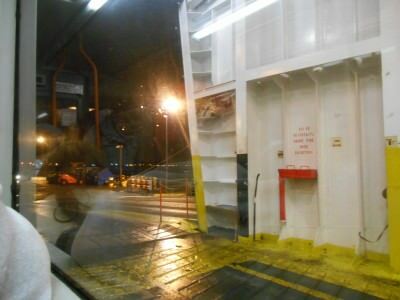 The ferry has an escalator. Up the escalator and we’re on as foot passengers. Got to be some irony in the fact that “foot” passengers get a bus onto the vessel! 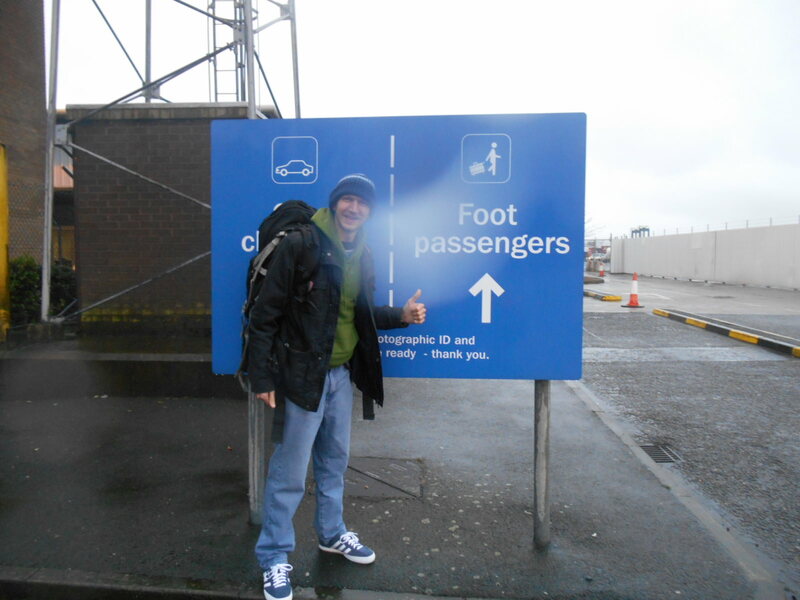 Boarding the ferry in Belfast by bus. 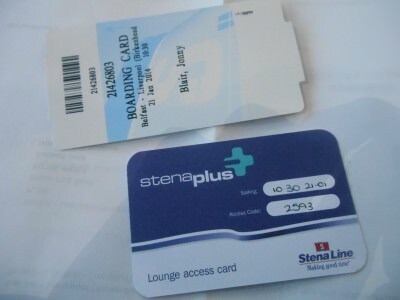 On board the Stena Lagan boat there is a “business lounge” called the Stena Plus Lounge. From my perspective I was able to get some work done in peace on my laptop and take advantage of the freebies. for the £20 I probably took about £40 worth off them – that’s standard for a backpacker. For me it was worth it. Your belongings are safer in the lounge, you have free tea, coffee, hot chocolate and orange juice. Free wine too. Free breakfast cereals, snacks, fruit etc. Let’s just say I milked it. As I got off the boat I also had a bag full of cans, crisps and fruit. So £20 – yes worth it! 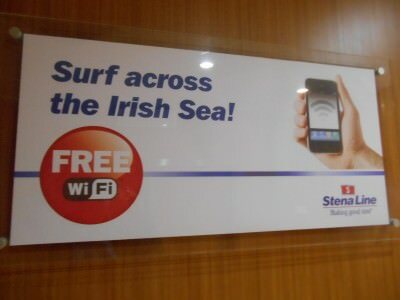 It also has internet access but please note it was very slow and intermittent (we’re at sea!) so not ideal for updating a travel blog, however as usual I did all my stuff online. 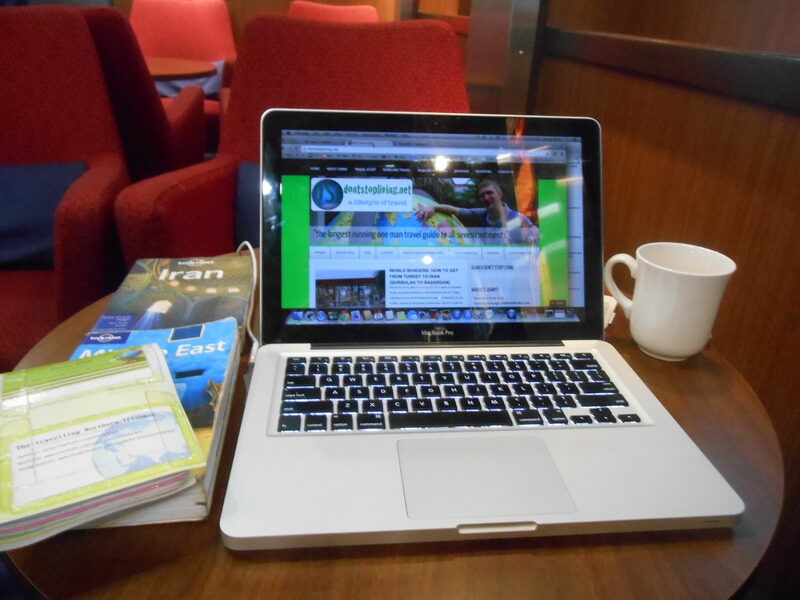 Updating my travel blog on the Irish Sea in the Stena Plus Lounge. 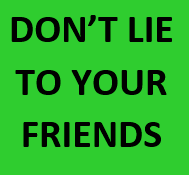 I’ll have to state the obvious here. There are no passport stamps and no immigration. There were not even any bag checks. On occasion there might be bag checks. 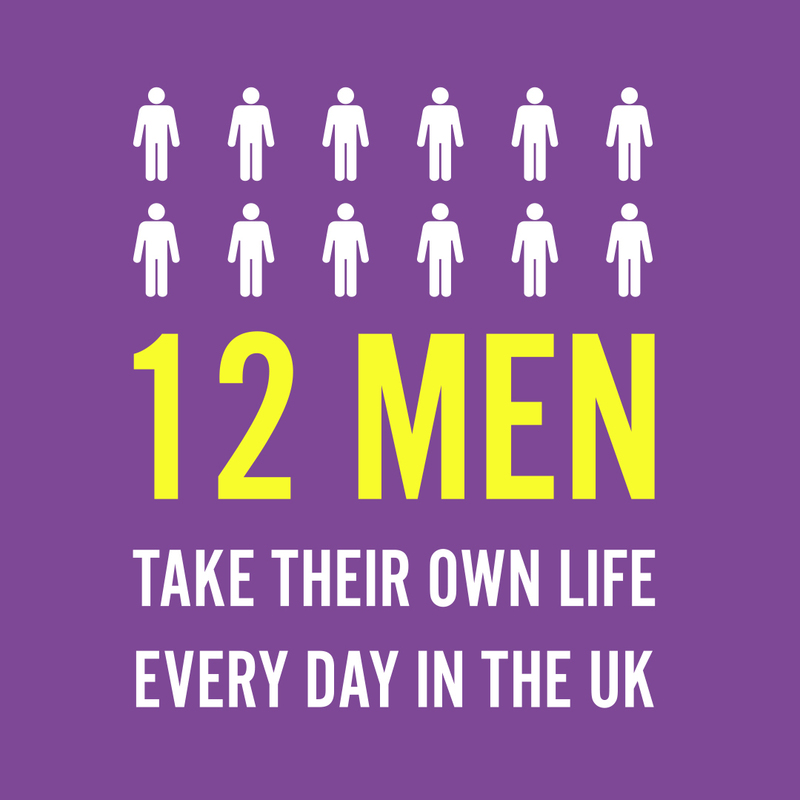 You might wonder why. The fact remains, Northern Ireland and England are both countries within the UK and therefore there is no border control needed. The only border control you will witness between countries in the British Isles is between Northern Ireland and the Republic of Ireland. 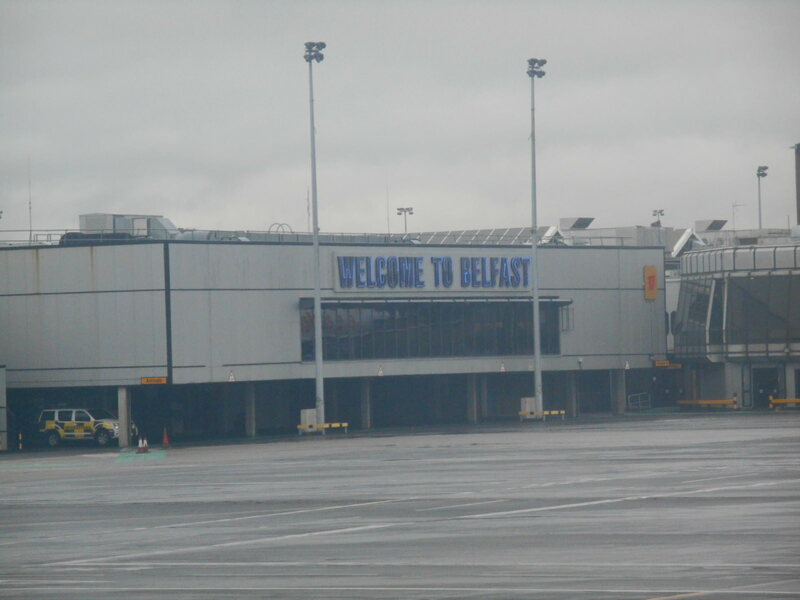 Flights from Scotland to England, Wales to Northern Ireland etc. are the same. 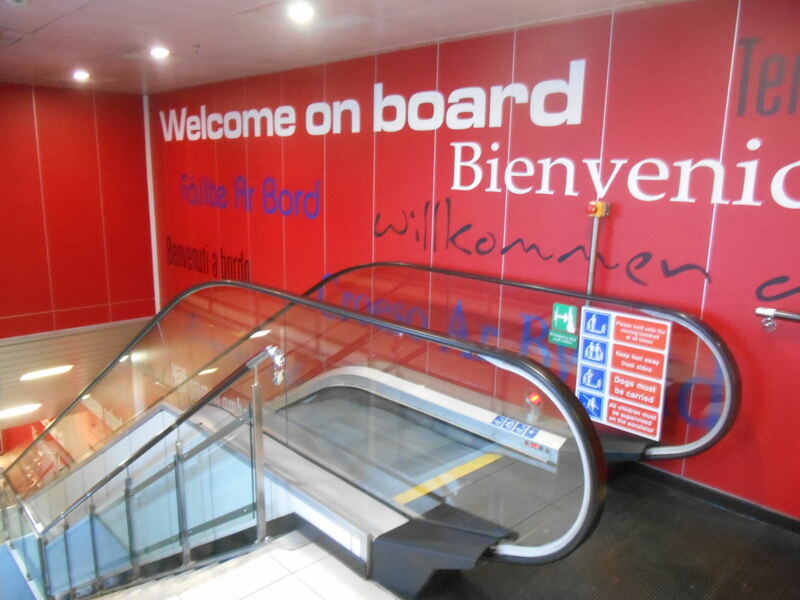 You need ID to board, but you will not be stamped or given any type of “immigration cards”. There is no internal passport stamping or immigration between countries within the UK such as Northern Ireland and England. Leaving Belfast is always tinged with emotion and as the Stena Lagan sailed away I pondered on where the hell life had taken me. This was my first time back in Northern Ireland since passing the 10 year mark away and I followed the ferry away from beautiful Northern Ireland until the land was no more visible. Leaving behind good old Belfast, Northern Ireland. 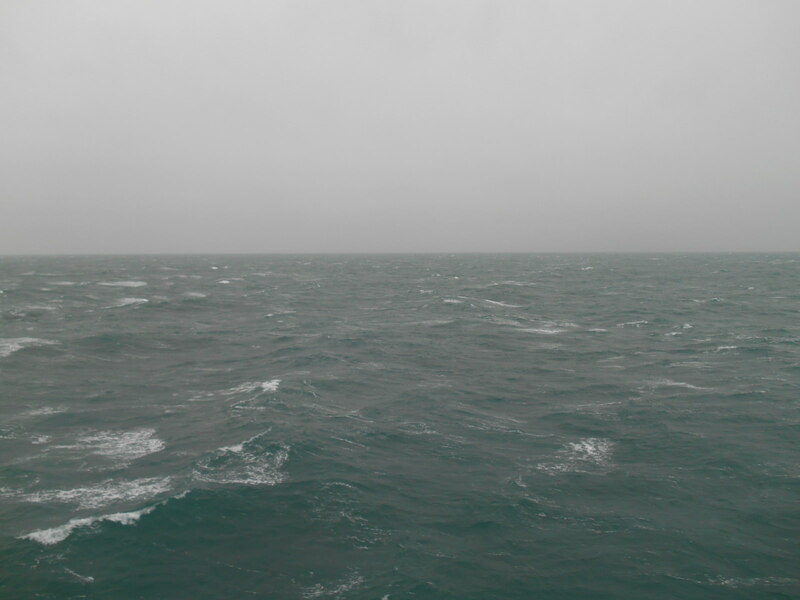 I love being at sea. I used to work on ferries and also try to promote living a life of travel by working on Cruise Ships. It’s a peaceful and calm way to travel. Here are some photos with descriptions of the different parts of the Stena Lagan ferry. 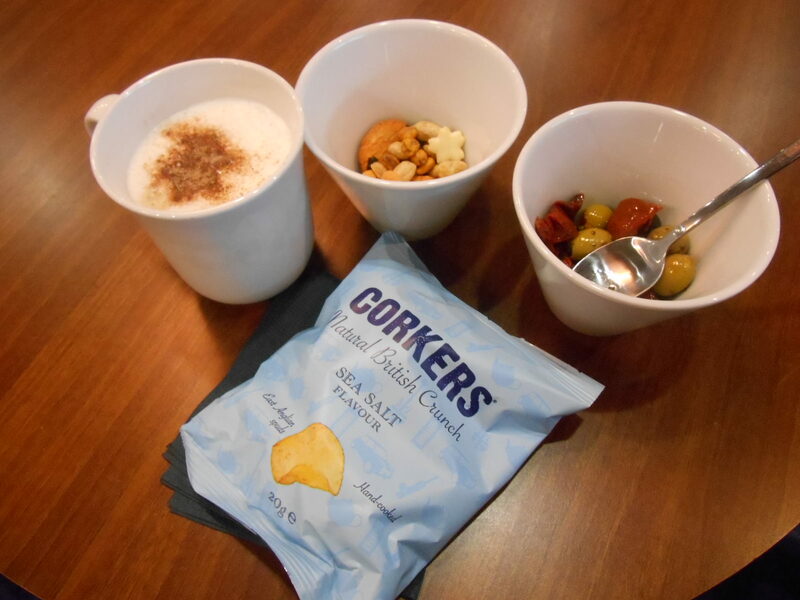 Mid morning snacks and coffee! Free food in the lounge. There’s an onboard cinema – these are the films. Wow – changed times you can now get online (albeit slow and intermittent). 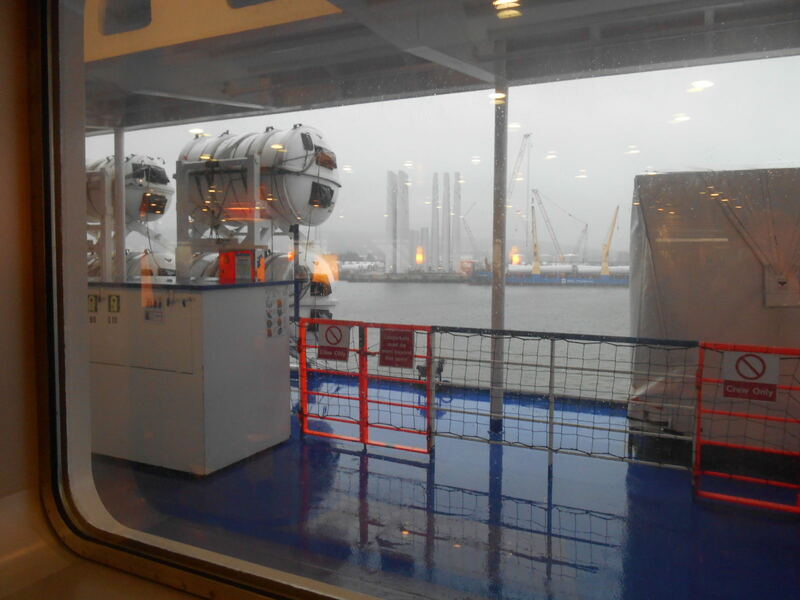 View out on deck as we leave behind Belfast city. 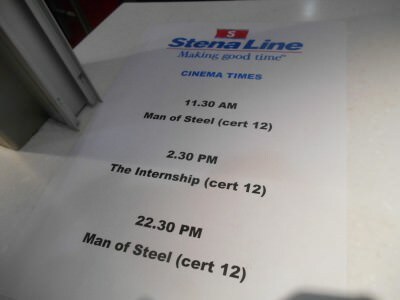 The Stena Plus Lounge/travel bloggers lounge. 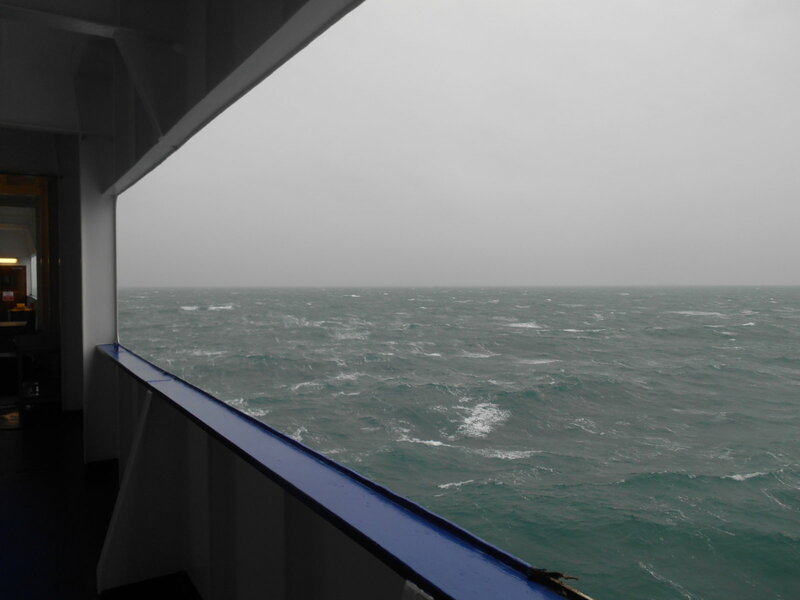 The journey across the Irish Sea is fairly smooth and I always enjoy it. We arrived into Liverpool on time at 6.30 pm so the journey is about 8 hours. During the journey I ate, drank a lot of tea and coffee, updated my travel blog and planned my upcoming trips and relaxed. 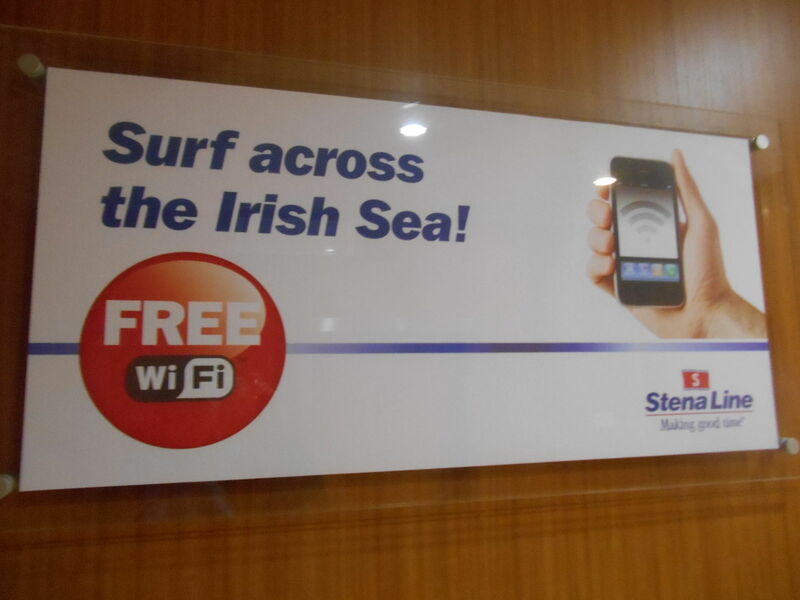 Sailing across the Irish Sea – keep your eyes peeled for the Isle of Man! If you look carefully and on a good day you can see the Isle of Man. I didn’t on this occasion though. Arriving into Birkenhead, Liverpool, back in England. 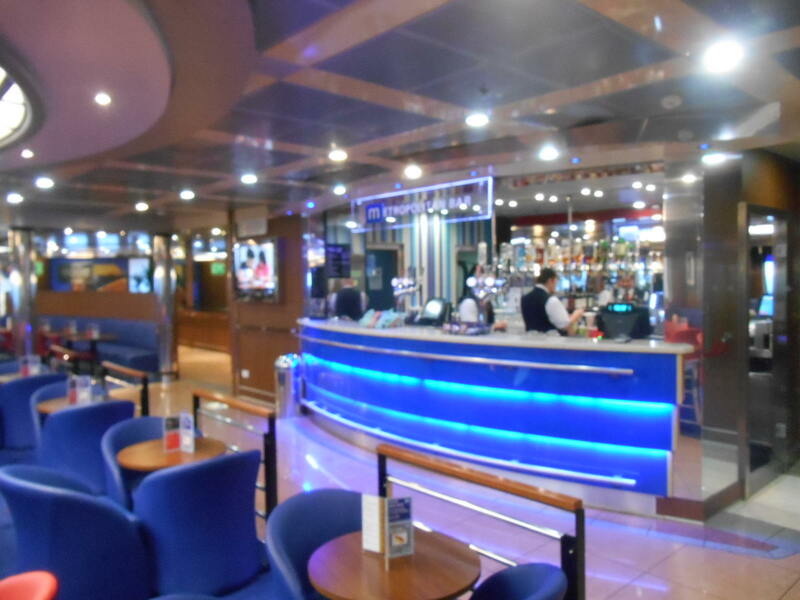 You can really relax on board the Stena Lagan – it was also pretty quiet and a really easy place to chill out and get work done. Arrival into Birkenhead in Liverpool England is smooth. Camera buffs will like the view of the city of Liverpool across the bay as you sail in. There is no immigration procedure, no passport check and no bag checks. It is very smooth. Vehicles are let off the boat first and foot passengers get another bus to the terminal. Leaving the ferry on arrival in Birkenhead, Liverpool. 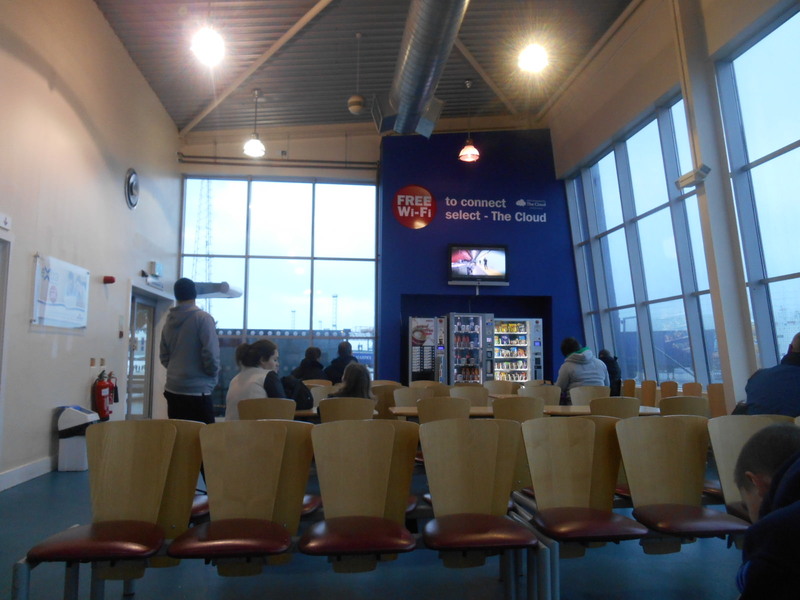 From the terminal you are still in Birkenhead which is quite far from Liverpool city. You can pay for another bus from the terminal to the train station at Hamilton Square and head on your way to the city centre from there. 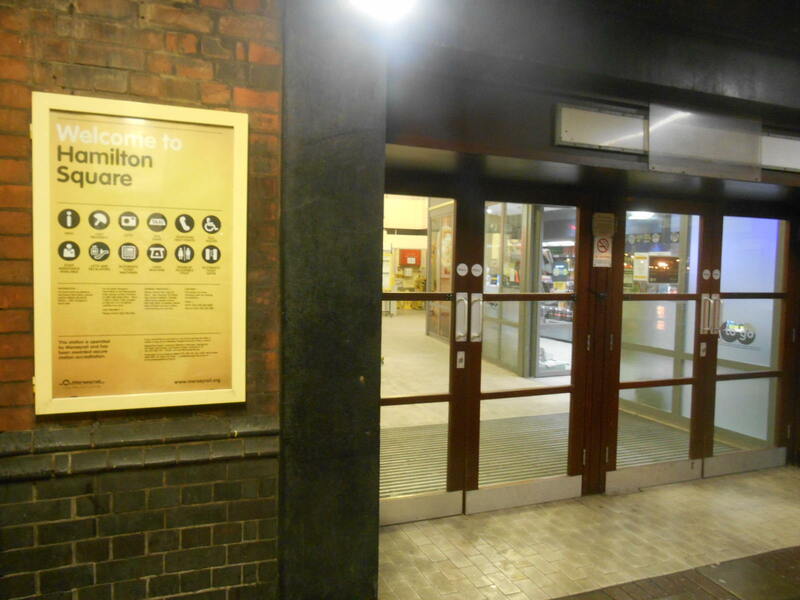 Arrival at Hamilton Square train station in Liverpool, England. I haven’t properly written about backpacking in Liverpool yet but my youngest brother lives there and I included Liverpool in my top 5 backpacking places in England. I’m sure I’ll get some more stuff written at some point. This entry was posted in Belfast, Birkenhead, Boats, Destinations, England, Europe, Ferries, Liverpool, Northern Ireland, Transport, United Kingdom, World Borders. Bookmark the permalink. Regarding your Belfast to Liverpool ferry: if I do NOT want to pay for a cabin, will I be able to sleep? Are there some sort of chairs to sleep on? Any guidance would appreciated as I am playing to to the overnight ferry to Liverpool. Hello Jonny, do You know maybe if there is same procedure and no passport control between Dublin and Liverpool by ferry?